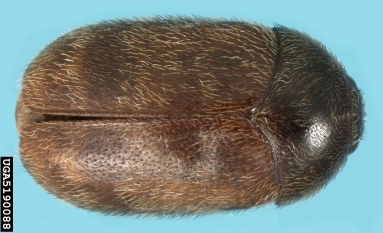 The Khapra Beetle (Trogoderma granarium) attacks stored grain. Surveys are conducted because of the presence of potential host material in Wyoming and high potential for establishment after introduction. It has been found and eradicated in the US in several states, most recently in 1997. To date, it has not been found in Wyoming. Two hundred seventy-two total traps have been placed throughout twenty-two counties in Wyoming. The Wyoming Khapra Beetle Survey is conducted through a joint effort between USDA APHIS PPQ and the Wyoming Department of Agriculture. Baited traps are placed throughout grain storage facilities from June until September. The traps are collected and monitored for suspects at the end of the season. If suspects are found they are sent to USDA APHIS PPQ for identification.